10-Year Accidental Stain Protection for your new mattress. 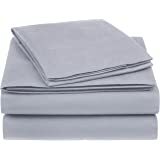 Includes a breathable BedGard Mattress protector made with cotton blended terry. 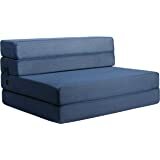 Sure Fit construction for mattresses up to 18” deep. See terms and conditions for complete details. Sold by Utopia Deals and ships from Amazon Fulfillment. 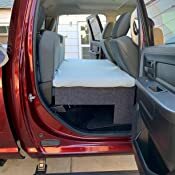 5.0 out of 5 starsGreat pad for camping! 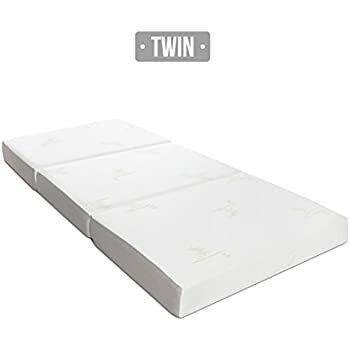 This mattress is not as wide as a full twin size which is why we purchased two of them. They fit perfectly on our camping cots. We just returned from a 4-day tent camping trip and the pads worked great! 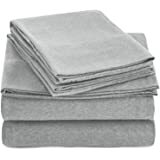 They come with their own pad cover that can be removed and washed, and also a storage bag with Velcro straps to keep them rolled up. 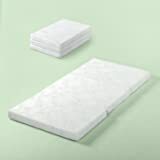 The pad was thick enough to absorb and remove any joint pain for a very comfortable sleep, but thin enough to be able to roll up and pack on the trip. 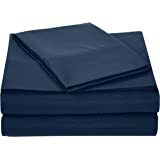 I highly recommend this pad for tent camping or for camp cots. 2.0 out of 5 starsThis is NOT 3 inches of "memory foam" as advertised! 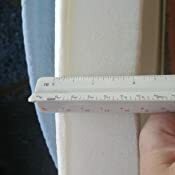 1) It is not 3" thick as noted in the product name, nor is it even 2.75" thick as noted in the product description. It is barely 2.5" thick. 2) I do not think it meets the criteria for "memory foam"... it is just regular foam. It is not very dense, and does not retain a handprint for even a fraction of a second when you press your hand into it. The foam has a lot of give, so heavier parts of your body will not be cradled by the foam, they'll just sink. 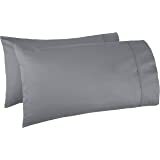 3) Given the above, it isn't worth the $70 I paid for it, expecting 3 inches of true memory foam. Had I known it was 2.5 inches of non-memory foam I would have expected to pay maybe $25 at most. Quite honestly I think this is false advertising and I am not at all happy about it. 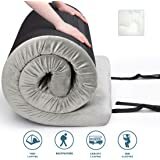 The reason I'm giving it 2 stars instead of 1 despite the above criticisms: it was better than nothing, and better than the sleeping bag on a hard floor that I had been using previously while watching TV in my man-cave. 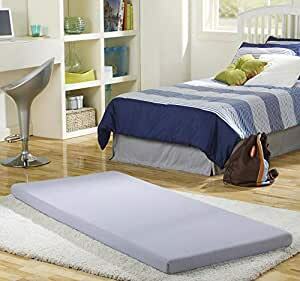 1.0 out of 5 starsBeware, Not Memory Foam. This NOT memory foam. It is comparable to a piece of foam you can buy at Joannes or any Fabric store with a little topper that comes on and off. Literally a Piece of Foam on the bottom. I just am so sick of ordering things that come not as described. 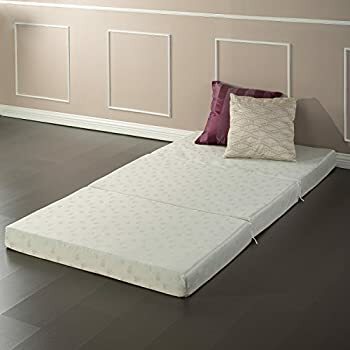 I'm using this as a mattress topper for my half of a queen bed (it's exactly half the width) it looks silly but my partner prefers a super hard old mattress. I like it but I did want something more plush that you sink into. I think this one was designed to work on the floor which I haven't tried but it probably would work. 5.0 out of 5 starsExactly as I expected. 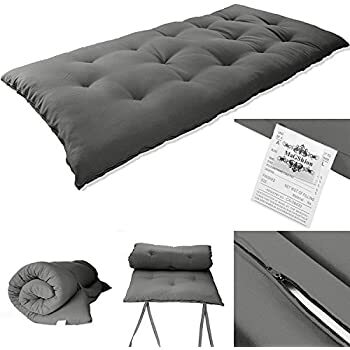 I bought this mattress to use when camping. Every air mattress I've ever had leaks and it's a real burden to wake up in the middle of the night laying on the cold, hard ground. Plus, I don't feel safe having my baby sleep on an air mattress. 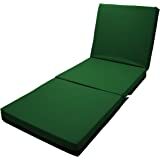 My family of four (2 large adult and 2 tiny kids) normally sleep on a king size bed so we bought two of these to put them next to each other and sleep sideways. It works and it's comfortable! We also used them for guests and they said it was comfortable. 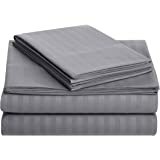 The mattress comes with two straps that hold it rolled up and then an oversized storage bag. 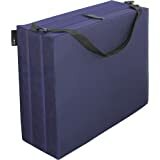 There's also a sheet on it with two straps on the bottom to hold it on. 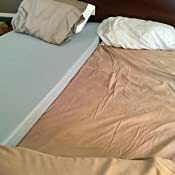 I plan to use take an old flat sheet and turn it into a cover that will fit like a pillowcase because the bottom of the mattress isn't covered. 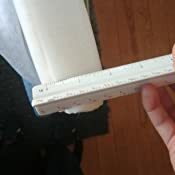 1.0 out of 5 starsNot 3” of memory foam just foam! 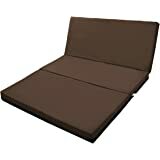 Please if you order this product based on the 5 star reviews that’s ok but as soon as you receive your Simmons Beautysleep Siesta go ahead and take out cover that’s strapped to it and see that there’s is only 1/2” of memory attached to 2 and half inches of foam that you can purchase for cheaper at Joan’s or Michales art supply store and then roll it back up and get your money back! Amazing. What a difference than a worn mattress. 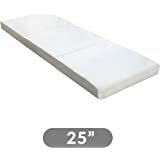 I was waking up daily with back pain from my old bed but slept my first night on this new memory foam and it was great. 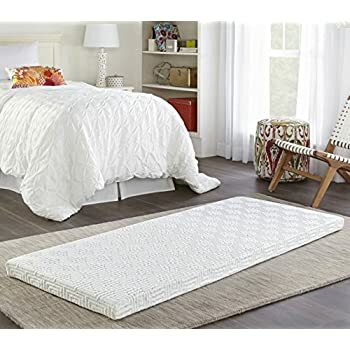 It could be a bit wider but the length is perfect and it is good memory foam. Contours to your body but returns to its original state after you get off of it. 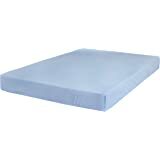 It has a very firm mattress feel to it but yet very soft and comfortable at the same time. Careful, the item description does not use the USA sizing. 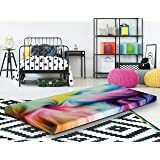 Normal twin size = about 39 inches wide x 74 inches long. Theirs is: 31 x 75. I had to return it since it did not fit, but it was really comfortable when I did try it.